I’m right with you. Sometimes it seems we’re always rushing to the next step, looking forward in a way that impedes our ability to enjoy the moment. Finding a balance between enjoying what we have and working towards what we want is not easy – but we’re amongst the world’s most fortunate to have the challenge. Not everyone has the opportunity to work towards something meaningful … or even much opportunity to enjoy the moment. I’m curious about the creature in the photo. Did you take this image yourself? Did he get free? 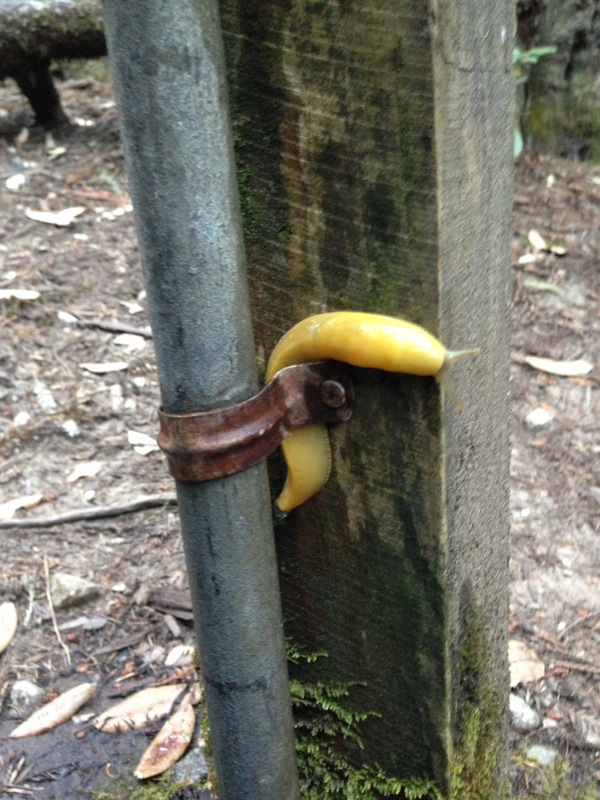 That darling banana slug entertained me and the boys for about an hour in the mountains near Santa Cruz on a camping trip. She was never trapped. She lounged about in the camping water spigot, then slimed her way up the water spout. And she inexplicably crawled through, rather than over the clamp you see. She continued on her merry way to the top of the post, then back down. The process of wandering four feet total took her about an hour. And my youngest sat there the whole time and watched. I’ll sit with Butter all day any time to watch a banana slug slime away. I watch squirrels and birds with my dog on the patio. Hawks are migrating now, the skies are filled with redtails and vultures. Better than paint drying. Brain yoga.